These lessons are designed to help the teacher and/or producer-director of a Peace Child show to get the young children of their casts think seriously about what they are performing. I know from bitter experience how hard this is – how hard it is to get 10-year olds to concentrate for more than a second on issues like the ones raised in this Peace Child show. However, there are many, many teachers, parents, theatre people and voluntary workers who know far better than I how to work with younger children – and get them fired up to explore global issues that affect their future and feel empowered to act upon them. Those are the people that these Lesson Plans are written for. Dig deep – and communicate their messages to the children of your cast or classroom. Lesson TWO: Where are we now? Lesson THREE: What needs to be done? Lesson SIX: ACTION! What can young people do? To get the kids of your cast to think positively about the trajectory or their lives. To convince them that the world they will be living in by the time they are grand-parents will be a much happier, fairer, richer and more sustainable world than the one they are living in now. The Purpose of this Lesson is to get them to IMAGINE what that world might look like – NOT to think about how they are going to create it! ONE: There is far, far more written about potential negative futures than there is about the positives. Even in Al Gore’s celebrated ‘Inconvenient Truth’ lecture – which has apparently been updated to include a more positive image of the future – there are 263 slides in the gloom and doom section compared to 97 in the positive section. There is simply much, much more bad news about the situation we find ourselves in than good. And kids may be right to think that some of the problems we face are insoluble. TWO: The primary school kids I have worked with seem more comfortable with the doom ‘n gloom scenarios than what they perceive to be ‘Pollyanna-ish’ visions of a positive future. 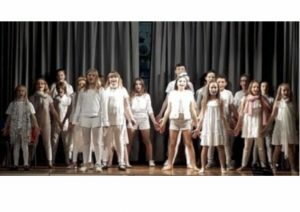 In a recent production, they refused to say ‘sappy lines’ and refused to sing ‘mawkish songs…’ Where-as they couldn’t get enough of the ‘Our World is dying’ stuff. Go figure! However, these obstacles must be cleared as Peace Child is as nothing if it does not have a happy ending. And, as teachers or parents, you cannot afford to allow your child or charges to slip into a myopia of negativity: recent research by the Prince’s Trust found that over half the children in Europe had attempted suicide or done themselves significant self harm. Getting young people to think positively about the future is one of the major goals of Peace Child. The World We Made – by Jonathon Porritt; Phaidon, Oct. 2013 – the world in 2050 as seen by Alex McKay, a history teacher who has watched the world become a more sustainable, happier place in his lifetime. Written by Britain’s leading environmentalist, it replaces the gloom and doom scenarios for one in which a green economy has been created – and everyone is better off as a result. Picturing a Sustainable Society by Lester R. Brown, Christopher Flavin and Sandra Postel; 3 x top environmentalists picture the world of 2030 as they would like it to be. The Future we Want – the slogan employed by the UN for their Rio+20 Summit. Now a website full of ideas you can use to help young people be inspired by the future they are heading towards. Kids ‘ Whole Future Catalog by Paula Taylor: Intriguing vision of the Future from 1982 – but still getting good reviews from parents who first knew it when they were a child, and are now showing it to their children. What time is it? The story teller asks: “What time is it?” What answers would you give? Forwards or Backwards? Before the fossil fuel era began in the 18th Century, human life across the planet was pretty sustainable: people rode horses, used water power, and sailed the seas. Ask the children if they feel that we will have to learn to do that again? Will the transition to a green economy be a step forward or backwards for humanity? Are there alternatives? Is a green, sustainable future the best future on offer? Can your children think of any alternatives? – or, perhaps more important, can they think of a different kind of sustainable future? What else could we do? Embrace the current ways of life and do nothing until they become impossible? Is any growth/development sustainable? “Sustainable development meets the needs of today’s generations, without compromising the ability of future generations to meet their needs…” Is that possible? This is quite an esoteric conversation to have with primary school children – but the idea of population, industries and communities growing, growing, growing while the natural resources of our small, finite planet are shrinking, shrinking, shrinking – is something that some of the children I have worked with can get their heads around. And – of course – this is the heart of the current intl. development debate, so – in imagining the future – addressing the question: “How can we end poverty without destroying the environment on which we all depend for life?” – is fundamental. And, for future generations, like your children, it is fundamental. So – raise it if you can. All improvisations are designed to tease out ideas for inclusion in the revised script – so scribble down ideas for lines as the improvisations are happening, or video them for future reference. Stream of Consciousness: Play some gentle music; maybe get the group to hold hands in a circle and have someone guide a meditation on the World in 2050! How will a family of 10 billion human beings live comfortable, interesting lives on a small fragile planet? Take copious notes – or maybe even video the session as the point is to let the children’s minds flow freely and come up with wacky ideas that no one would ever think of through rational processes. The Insoluble Problem Quiz Show: If possible, set up the challenge of this Quiz show as a Homework Assignment: the questions it raises go to the heart of the whole Peace Child story. Start by asking one of your cast members to take on the role of their favorite quiz master. Then split the rest of the cast into Questioners and Answerers. The Questioners pose problems that they believe will NOT have been solved by 2050. The Answerers have to come up with a convincing / plausible answer as to how each problem will be solved. If they do, they get a point. If they don’t, the Questioners get a point. If you can assemble an audience of other students, they can be the judge of whether or not an answer is “convincing/plausible” through a show of hands. If you are on your own, you can be the judge. Of course, half way through, the Questioners and Answerers change places – and the Answerers can pose problems of their own. What is Peace Day all about? This is like the audition improvisation. You set the scene – there has been a race riot in your town and the Mayor is all set to cancel the Peace Day party / Celebration. Set the improvisation with two kids – one as the Mayor, adamant that the celebration must be cancelled (“We cannot celebrate while some of our brothers and sisters are lying wounded in hospital! !”) – the other as a Senior Town Councillor who is equally adamant that the party must go on, (“At a time like this, it’s even more important for our community must celebrate its diversity!”) Keep changing the kids who are doing the improvisation – and have them switch roles. The Basic Primary School Script includes one way of doing this crucial first scene. Different producers have done it many other ways. (One did the scene as a break-out dialogue from the song; others have done the scene by having the children interrupt the Story-teller has s/he tries to start reading the story….) We suggest that you read some of the Reading List included in Lesson ONE (above) – and then move through the discussion points and improvisations and make your own decisions. However you choose to do it, you must get your cast to answer the main question: “What would you like your world to look like in 2050?” Get each child to give ONE answer, or to write one idea down on paper. Then read them out – or put them up on a chalk board. Or give them a home-work assignment to go home and ask the same question of their family and friends – and come back on another day with their answers. Tell them the old lines, like: “If you don’t know where you want to get to, you have no idea which way to go!” “Dare to Dream!” / “Some look at the world the way it is and ask ‘Why?’ – others look at the world the way it could be and ask: ‘Why Not?’” This is probably the most important Drop-in of Peace Child so do spend some time at the start of rehearsals exploring it. If your children are interested, you can – as we did in a performance at UNESCO in Paris, extend the discussion to the audience at the end of the show. Lesson II: Where are we now? To give the children of the cast a more detailed account than they get in either the Story-teller’s speech or the song, World, on the State of the World today – and what governments, educators and others are doing about it. Our purpose is NOT to scare them or fill them with doom and gloom – but it is only when we allow children to understand the scale of the problems that they will face in their lifetimes that they will take the trouble to explore the myriad of solutions we shall come to in the next lesson. “The generation now being educated will have to do what our generation has been unable or unwilling to do: stabilize a world population which is growing at the rate of quarter of a million each day; stabilize and then reduce the emission of greenhouse gases which threaten to change the climate; protect biological diversity, now declining at an estimated rate of 100-200 species per day; reverse the destruction of rainforests now being lost at the rate of 116 square miles each day; and conserve soils now being eroded at the rate of 65,000,000 tons per day. “Future generations must also learn to use energy and materials with greater efficiency. They must learn to utilize solar energy in all its forms. They must rebuild the economy in order to eliminate waste and pollution. They must learn how to manage renewable resources for the long term. They must begin the great work of repairing the damage done to the Earth in the past 200 years of industrialisation. And they must do all of this while addressing worsening social and racial inequities. Heat – and anything and everything by George Monbiot – Britain’s foremost writer on global issues. The Terrifying Math of Climate change – by Bill McKibben. The landmark article in Rolling Stone which changed many minds. Pension Funds and Advertising: These last two are not on the MyWorld2015 list but many experts consider that, because the first requires capital growth to pay non-workers their ‘salaries’ and the second is required to encourage us to consume ever more stuff, they are, together, the two biggest obstacles to creating sustainable economies. What do you think?? Other? This is perhaps the most important thing for your cast to discuss: global issues that are facing your communities most acutely – that do NOT appear on any list. TWO: How Many Issues? Ask your cast: “How many of these problems should be addressed in the play?” You could do this in a second Ballot, or you could choose the number yourself, or you could cluster them (several do link to each other) – or you could just try to address all of them. THREE: Does ‘Doom ‘n Gloom work’? Look at the images on the World file – and the passion and the anger with which David Essex sang its first recording (see: http://www.youtube.com/watch?v=XtAHUpdj1qY) and ask yourself – and your cast: am I moved by this? Am I compelled to take action?? – to do something to change this?? Remind them that, famously, Bob Geldof watched the horrific images of famine in Ethiopia in a BBC Newscast – and was moved to organize Live Aid, the 1985 global concert that raised $300 million dollars for the victims of the famine. Is that proof positive that doom ‘n gloom reporting can work? Can you frighten people into taking action or only frighten them into a state of numb, depressed acceptance? FOUR: “Are we crazy enough to destroy our world?” Well – are we? Do your own homework assignment, looking back at history and discussing all the stupid mistakes we have made – from the Trojans dragging in the Trojan Horse to fighting the First World War too early, to Vietnam, Iraq, Brexit, Trump – be controversial! Humanity has clearly done some very dumb, stupid things. But right and truth has prevailed in the end, hasn’t it? Or has it??!! Remember that Peace Child is all about Happy Endings so don’t get carried away, but allow the kids of your cast to wallow in despair for a while if they want to! What’s the “Time”? The Storyteller asks: “What time is it?” Conduct the same conversation with your students BEFORE you read the script – and see what answers they come up with, first for the Present – then for what they would like the “time” to look like in 2050?? What are the problems? The Storyteller also asks: “Is there anything wrong with this time we’re living through? ?” Looking at this question from the perspective of the PRESENT, your cast will be able to create an improvisation around everything they have learned from their background reading and discussion points (above). Then ask them to do the same improvisation, imagining that they are their grand-children in 2050 – take careful notes and feed back to them what they feel has changed in their lifetimes – and then go on to talk about HOW it changed? Explore different reactions to bad news: Set up a 3-way improvisation. Two children are waiting at a bus-stop – both feeling bored and frustrated by the late arrival of the bus. A third child rushes up to them and tells them that a house is on fire – please come and help. One is eager to come, but is restrained by the other who argues that there is nothing they can do, don’t get involved, it’s not your problem, you’ve got a bus to catch etc. Then try the same improvisation with some one saying they MUST do something about climate change – or terrorism, or poverty; And change the roles of the eager to help and ‘not bovvered’ children. Then discuss: does bad news inspire action? The original idea of the world as a village of 100 people was developed by Donella Meadows, the acclaimed co-author of Limits to Growth. It was repeated in the UN’s Millennium Report, drafted by John Ruggie. Oxfam has done studies of how the 8 richest people on the planet own more than the poorest half of the population. (Insane, right?!) We got most of our figures from the 2016 review done by the 100 People Project. But it is an intriguing Math project to get your cast to find out new figures – for health, sanitation, welfare, jobs, people living in democracies vs. dictatorships etc. The village of 100 people model is the best way we have found to help children understand where the world – and the human family that lives upon it – is now. Lesson III: What needs to be done? To excite and inspire the children of the cast with information about the massive number of initiatives, innovations and policy changes that are available to local and national governments, international institutions like the UN, and young people themselves that can – and will – solve the immense challenges that we face as a human family. This is a massive list. Sorry – but you need to know that, here at Peace Child Intl., we want you to spend much, much more time looking at the solutions, than looking at the problems. So – read & watch as much as you can! The UN Sustainable Development Goals: 17 Goals and 165 targets for how the global family is going to provide decent, fulfilling lives for all its members and sustain and conserve the natural environment so that future generations can enjoy similar levels of comfort and fulfilment. Agreed in September 2015, the SDGs are arguably the UN’s greatest achievement since its member states passed the Universal Declaration of Human Rights in 1948. The World’s Largest Lesson: Produced by Project Everyone with support from UNICEF and UNESCO, this is the most comprehensive introduction for schools and teachers to the SDGs, with hundreds of resources, videos, lesson plans and teaching ideas. Check it out! Rocky Mountain Institute: ready anything by its founder, Amory Lovins – especially his recent, Reinventing Fire. The Introduction Video alone is brilliant. The Solutions Project: Project set up by Mark Jacobsen at Stanford University, California to promote the idea that “A world powered by the wind, water, and sun is not only possible – it’s already happening. With over 200 businesses, cities, and countries committed to 100% clean, renewable energy, momentum is building. The Solutions Project is here to support that momentum and accelerate the transition to clean energy for all. We honor clean energy leaders, invest in promising solutions, and build relationships between unlikely allies. Together, we can make renewable energy a reality for everyone – 100% for 100%. Andrew Winston’s Blog. His first book, Green to Gold was brilliant; his most recent, The Big Pivot, is better and his weekly / monthly blog is always inspirational and proves, again and again, why business can profit from embracing the Green Economy. The Post Carbon Institute – a bit more of the gloom and doom scenario – but a great de-bunking of the Fracking industry, and an effort to change the conversation, as evident in the name of the institute. Going for ten years now, it is one of the best: Read: The End of Growth, by one of PCI’s founders, Richard Heindorf. Center for the Advancement of Steady State Economics: US think tank that promotes the idea that you can only achieve sustainability through having a no growth economy. A bit theoretical but brilliant! Sustainable Energy for All by 2030: The UN’s excellent project to bring energy to every member of the global family by 2030. It prepares the Global Tracking Framework on the delivery of universal access to modern energy services. The 2018 edition shows that we are on course to double both the share of renewable energy and the global rate on energy efficiency improvements by 2030. Resource-Efficient Cities: With more than half of us now living in cities – a figure expected to rise to over 70% by 2050, the UN has several studies on how to making living in cities more sustainable. This one describes the policies that are going to make that transition to sustainability happen. Transition Towns: Rob Watkins brilliant approach to building the Post-Carbon, Green Sustainable Economy one town at a time. Zero Net Energy Households: See how your home can become a source of energy income for you, not a source of energy bills every month. Promoted by the Permaculture Institute and Sustainia, zero net energy households are the clearest path we the people’s can take to sustain our world. Car Free Days: Hundreds of towns and cities around the world hold days when cars are banned from city centres. Education for All: The UN has been fighting for education for all since the 1948 Universal Declaration of Human Rights. It is not there yet is clearly part of the solution that all children get an education so that they know what is going on. The Right to Protection (R2P): The solution developed by the UN in 2005, but yet to be properlyimplemented. By 2050, protection should be the right of every member of the human family. Colin Powell and his wife, Alma, brought together surviving US presidents to make America’s Promise to all its children: Peace Child sometimes argues that we should make a similar Global Promise to all the world’s children. The “Poor are always with us…” // “The purpose of life is to be a success, be famous, get rich – get to the top…” Which statement do you feel most comfortable with? What do we know about the United Nations? Is it an effective organization for ending poverty and leading the world towards a sustainable future? If not – why not? What is the difference between a Rabbi and a Vicar? Does religion or faith in a God have anything to do with the struggle for sustainable lifestyles?? Should children of your age be learning about things like this? Do you feel you are too young to worry your head about such matters?? “Don’t worry your little head about this, then….” The scene is in any cast member’s kitchen: ask each cast member to select a fact from the World as a village of 100 people scene – or any of the Sustainable Development Goals. Get another cast member to play the parent – and one by one, each child comes in and asks the parent: “What do we do about the world’s starving people?|” or “What are we going to do about Climate Change?” – and each time, the parent tells them: “Don’t you worry your little head about any of that….” – and the Parent improvises other arguments as to why the child should NOT bother about any global issue, and the child argues that s/he has a right to know what’s going on. This improvisation goes to the heart of what Peace Child is about. Take notes and feed some of your cast member’s thoughts into your version of the musical. This Drop-in comes here in this Lesson so that your cast can build on their Drop-in ONE deliberations about the World in 2050 with an exploration of what they might do in their lives to achieve such a world. Clearly, we are going to show – later in the story – that the Global Goals have a big part to play but they are extremely complicated and look at every aspect of future societies. In this drop-in, we want your children to look at the fundamentals: what does a Peace Child do in their every day lives? What might a Sustainable Lifestyle Contract look like? And, most important of all, what should a Peace Child do to ensure that Peace breaks out in their family, school and community. Read Martin Luther King’s “I have a Dream” speech – possibly the greatest call to peace the world has ever seen. And watch the video. And read his wonderful Christmas Sermon on Peace, his deliberate and carefully calibrated Riverside Church speech, lambasting the Vietnam War (listen to the video!) Martin Luther King’s life is a wonderful testimony to the need for muscular peace-building. His Nobel Peace Prize acceptance speech is great too – as was almost everything he ever said and wrote. Listen to the voice of Nelson Mandela defending his stand for Black Africa during his trial in 1964. Mahatma Gandhi’s writing on peace are always worth reading: in this time of fake news and terrorism, it is instructive to hear his commitment to “Truth and Non-violence”; Also great to hear his simple voice at Kingsley Hall in London; sprinkle some of his famous quotes throughout your version of Peace Child; and watch this extract of Richard Attenborough’s multi-award winning film, Gandhi, which distils the moment from which the idea for ‘kids on strike’ emerged. There are numerous Peace Research Departments in the world’s universities; famous ones are at Bradford University, the University of Colorado, the University of Peace – and many others. On these sites, you can explore the concepts of peace-building, conflict transformation, and the foundations of peace. A friend once told me that Peace is based on three things. 1) Peace Within – harmony within yourself; 2) Peace with the people around you – social harmony; 3) Peace with the natural world – harmony between humanity and all the plants and animals with who we share this planet. Read about Abraham Lincoln. It was he who first said: “I destroy my enemies when I make them my friends.” And his Gettysburg Address is perhaps the best defense of freedom and democracy the world has ever heard. What do we know about War and how do we know it? Who are the great peace-makers – and what do we know about them? How do you overcome these Obstacles? Continue the scene – with the teacher character going down the list inviting the students to come up with how they would overcome these obstacles. EG. Friendship; sharing meals and festivals; joint sports events etc. When it was originally written and performed in 2017, everyone wanted to know: “Where’s Sami from? – Afghanistan? Yemen? Syria? Central African Republic? Somalia? South Sudan? !” And we answer: “It doesn’t matter…” Because if you say where he’s from– you limit his identity. He is every child who’s ever been caught up in a war – from Bosnia to Ingushettia, from Kashmir to the American Civil War or the World Wars fought by our ancestors. So this speech has to be re-written – not just by the actor playing Sami – but by every child in your class thinking themselves into the shoes of any child whose witnessed the horror and tragedy of war. Painful to do – but, in the context of Peace Child, OK – because we know we’re heading for a happy ending where Peace reigns. To give the children of the cast an idea of the positive value of mobile phones, social networks, the internet etc. Many adults are increasingly concerned about the dominance of media in young peoples’ lives – and the potential for negative impacts on youth from the new media are enormous. But the potential of social media to connect people of all races, nationalities and cultures is enormous: and in this lesson, we want to inspire your children to see it in that light, and far and away their most powerful ally in their search for social change. Vance Packard: “The Hidden Persuaders” – written in 1957, this book was the first to expose the power of advertising to get under our skin and make us do things that we would not otherwise do. On its 50th Anniversary, the New York Times ran an excellent series of articles about this landmark book and product placement is now a $1.5 billion dollar a year industry! Naomi Klein: “No Logo” – an analysis of our corporate and branded world and a cultural manifesto for the critics of unfettered capitalism worldwide. Read the Extract run in the Guardian. The new buzz word about the power of the media is ‘disruption.’ Read Jean Marie Dru’s books: Disruption – overturning the market place, and Beyond Disruption to understand how completely marketers and advertisers are able to rail-road our minds. Also as mainstream media wanes in importance, online advertisers and media manipulators grow in power: read Carole Cadwalladr’s series of articles in the Guardian and Observer about how Cambridge Analytica and other online manipulations helped sway the results of the Trump election campaign and the British Brexit Referendum. The New Power of Television: some surprising results found by this new survey show a bright future for Television. That was what Campaign magazine chose to focus upon – but you would expect them to do that, wouldn’t you?! On World Television Day, 19 broadcasters launched the Global TV Deck to promote their power and reach to advertisers. It has a useful digest of key statistics about the power of media. The Power of Media Essay – by a student. Interesting if somewhat biased! Lesson VI: ACTION! – What can young people can DO? Doing a play is fun – and hopefully – instructive and empowering. BUT – what do you do then? Go on to the next play or ballet lesson? Not if you’re a Peace Child! In this lesson, I will bring you stories of the extraordinary young people and organisations who have helped young people do great things before their 18th birthdays. Every one of them were no more – and no less – talented than the children in your cast – and yet they went on to DO great things. One of them even won a Nobel Peace Prize. That’s what we want to inspire your children to do in this lesson. Seeds of Peace – was set up by John Wallach to inspire and cultivate new generations of global leaders in communities divided by conflict. John was a great peace-maker, and inspired thousands of young people to work for peace before his premature death in 2002 at the age of 59. Working initially in Israel / Palestine, young ‘Seeds’ were present on the White House lawn on September 14 1993 when Itzak Rabin and Yasser Arafat shook hands on the Oslo Peace Accords. Its network now encompasses 6,698 alumni throughout the Middle East, South Asia, Europe, and the United States who are unique peace-leaders and change agents. Jennifer Corriero – started Taking IT Global in her early twenties with her boyfriend, internet entrepreneur, Michael Furdyk: it’s an online community that networks and supports young people to get involved in global issues and realize their potential. Now married, Jennifer and Michael continue to expand and grow TIG, inspiring its 500,000+ members to understand and act on the world’s greatest challenges. It has been a partner of Peace Child International since 2002, helping to organise our 2008 World Youth Congress in Quebec City, Canada. School for Iqbal: Read the story of how students at the Broadmeadows School in Quincy, Massachusetts raised $100,000 to set up a school in the memory of Iqbal Masih – a young boy who was sold into slavery at age 4, but who escaped, spoke out against the practice of bonded labour, won a Reebok Human Rights award, and was then, like Malala, shot for speaking out. Unlike Malala, Iqbal sadly died – but the school lives on – a testament to his bravery, and an example to us all. Read an interview with the US kids who raised the money. Craig Kielburger – started Free the Children in 1995 at the age of 12, when he heard the Iqbal Masih story. He travelled to South Asia, raised millions of dollars, built schools, wrote a best-selling book – all with the goal of “empowering young people to remove barriers that prevent them from being active local and global citizens.” Then, with his brother, Marc, transformed the Free the Children charity into the Me to WE Social Enterprise – an initiative that inspires and enables people to become leaders and agents of change through unique volunteer trips that allow young people and adults to participate in health, education and economic development projects abroad. By making and selling consumer products that give back to the communities that make them, it empowers people to change the world with their everyday choices. Every ME to WE product sold contributes to lasting change in a community overseas through its innovative Track Your Impact model. Read Craig’s extraordinary story. Malala Yousafzai – the young Pakistani girl from the Swat Valley who, at age 15, was shot in the head for daring to go to school. She has become a champion of girl child education, and human rights – speaking out about the kidnapping of 200 young female students at a school in Northern Nigeria by Boko Haram. In 2017, she became the youngest-ever the Nobel Peace prize-winner for her efforts. She has co-written a book about her life, and a feature film, He named me Malala. The 2013, 2014 and 2015 issues of Time magazine featured her as one of the most influential people She is now a student at Oxford, studying for a bachelor’s degree in Philosophy, Politics and Economics (PPE). Hugh Evans: Young Australian of the year who has been working to eliminate poverty since he was a teen-ager. He set up the Oaktree Foundation – which; he then launched the Global Poverty Project which has morphed into Global Citizen – probably the world’s premiere youth mobilization organization leading the fight to end poverty. Don Richardson’s Peace Child: The story of the Christian Missionary, Don Richardson and his wife, Carol, who discovered the indigenous Peace Child story while working in Papua New Guinea: it told of how, when warring tribes made peace, they exchanged a baby to seal the peace between them. The babies grew up in the others’ tribe and if, in the future, conflict threatened, the elders of the tribe would send out each child to negotiate a new peace between them. Such a child was called a ‘Peace Child.’ Don Richardson, the Missionary, used the story as a parable to explain how God sent His Child – Jesus Christ – to negotiate peace between Himself and human beings. Peace Child International (PCI) uses the same to demonstrate the wisdom of those elders who recognised that children can be great peace-makers, and empowered their young people to take responsibility for negotiating a fair peace and avoid war. You should read Don’s book, or watch the film. Check out these, and many, many more sources. You can spend a lifetime researching what can be done. And you should because you can never have too much knowledge about this, the central challenge of our time – our generation. – http://unfccc.int – the main site of the UN process on climate change. How to get from today (consumption and climate change as usual) to tomorrow (no more global warming, sustainability, renewable energy and a green economy)? Put aside the question of whether or not young people can have any role in this journey: assume that youth can. Indeed, assume that no other sector of the population has either the appetite or the ability to make that journey. So – how are you going to do it. Boycotts, strikes, mass marches, social media …. Consider the whole armoury of tactics and strategies for achieving change that are at the disposal of young people: and then figure out how to deploy them. Feel your power! Recognise the strength that – collectively – you have as a generation! In you, is invested all the treasure earned by your elders: the education, the healthcare, the research, the poverty-eradication programmes…. All invested and deployed on your behalf with almost no consultation with you – the youth – to see whether or not the investments are going where you want them. Is that fair? If governments, and the older generation, are making all these investments in your future, at what point should young people have a say where that investment is targeted? Discuss! What did happen when the Elder Diplomats and the Youth started Talking? How many times do you think that the youth had to threaten to go back on strike before the governments agreed to do what they wanted? What were the key actions that the youth themselves agreed to do to bring about the Green, Sustainable Economy powered by renewable energy? How much action was taken at the International Level – and how much was delegated to the national, local and personal levels? What was the role of schools and Universities in the follow-up? What was the role of doctors, lawyers, businessmen, politicians, scientists, farmers, women – all the major sectors of society, including – of course – young people themselves? And what was the role of younger children – the under-13s? Lobby, Advocate, Arrange meetings; BUT – protest doesn’t do any good. We’ve learned that! Join a local environmental group: BUT – none of the groups are having any impact on government! Take local holidays; don’t go abroad; BUT – greens have no fun! Change sides at least once, if not twice, during the debate – and get the scribes to stay where they are, writing up the other side’s ideas. Go for about 20-minutes – if you can! At that point, the side that has the most clearly articulated ideas wins. Let’s hope it’s the “Can Dos!” – but, if it is the “Can’t Dos!”, that tells you something about the size of the mountain you have to climb in this play! Here the Cast have a choice: they can either have a series of scripted questions given to “plants” (probably teachers or older students) in the audience – matched by answers given to the kids of your Core Cast. Or, if you are brave – you can open it up to random questions from the audience. Most do a combination of the two – starting with scripted questions and answers which, one hopes, will inspire your audience to dive in with new questions. But – of course – some of these will be unanswerable: so you might feel safer scripting the whole thing: safer, yes! – but nothing like as much fun. Try this “Live Drop-in” with some known, safe audiences of teachers and older students. If the students enjoy it, do it with unknown audiences. But if they are terrified, go back to scripted questions and answers! The Global Goals are immensely complicated. Very few children are comfortable with the language they are expressed in: most find it intensely foreign and confusing, as our scene shows. So – we invite you to discuss this round-up of solutions on how to achieve the Global Goals with your cast, and decide how you are going to cluster them. Take advice from other NGOs working in the Eco / Sustainability fields – and get them to help you write your own cast’s version of the Children’s Call to Action. What governments (Local and National) can – and should – do? What business and industry can – and should – do? What schools and Colleges can – and should – do? What we (young people and families) can – and should – do? What am I going to do? Write a list here of the promises I will make, sign and keep!